A day after Rep. Heidi Scheuermann (R-Stowe) said she was considering a challenge to Gov. 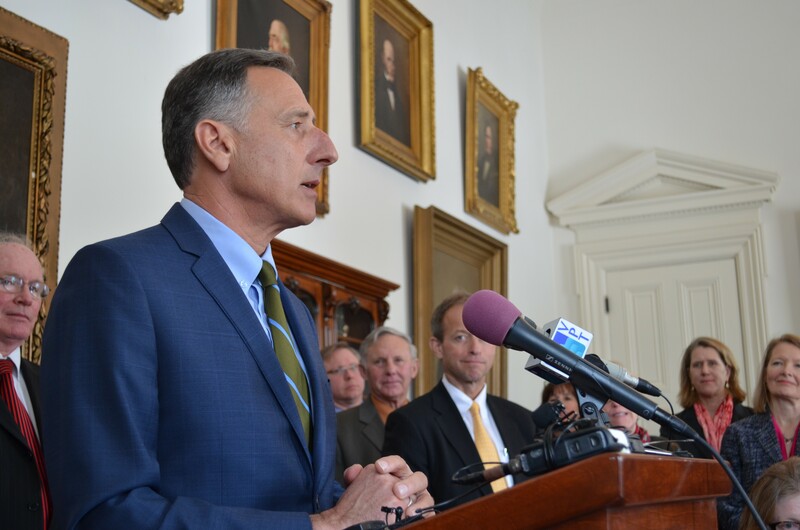 Peter Shumlin, the second-term Democrat declined to weigh in on his potential opponent. "You know, I'm always hesitant to comment on any of the 180 legislators," the gov said at the Statehouse during his weekly press conference. "You know, they're all great. They're like kids. You don't want to start talking about one, because you hurt the feelings of the other." Insisting that he "love[s] going out and talking to Vermonters, asking them whether we're on the right track," Shumlin nevertheless said he wouldn't be hitting the campaign trail anytime soon. "I put off any discussions about what next, who next or why next until Labor Day, or shortly thereafter," he said. "I'd be happy to talk about it after that time, but what I'm going to do, meanwhile, is focus on my job of creating jobs." Of course, the gov's been spending plenty of time recently focusing on something else: fundraising. Asked whether he agreed with Scheuermann's assessment that he's "beatable," Shumlin said, "Again, let's find that out on Election Day." "I think that, you know, if I don't do my job, I, like every candidate, am beatable," he continued. "So what I focus on is doing my job. Creating jobs. I've created 11,000 new jobs in this state, almost. I want to create more. I want to continue to meet the promises I made to voters. And I think they'll judge us on that. We can discuss it after Labor Day. You know, Vermonters, I don't think, by and large, want any longer a campaign than I do. They want their governor doing their job, and I'm going to do my job." Scheuermann, who stood in the audience during the governor's press conference, disagreed. 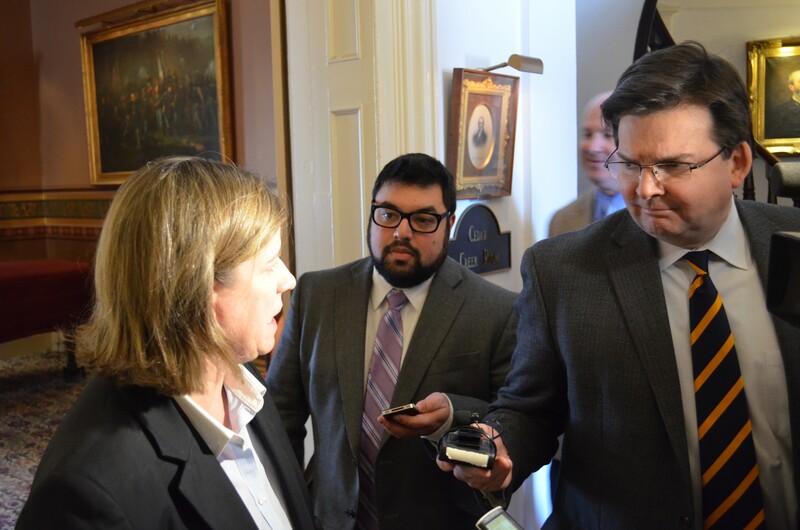 "I know the governor doesn't want to engage in the campaign until after Labor Day, but I believe Vermonters want a campaign that's going to start as soon as — just after the legislative session," she said during an informal press huddle after the governor concluded his remarks. Scheuermann said she's continuing to conduct "due diligence" on her gubernatorial prospects and will decide within a month whether she is, in fact, running. While the Burlington Free Press reported that the governor “has spent about 28 days on fundraising trips” in the past year, Shumlin spokeswoman Sue Allen takes issue with that characterization. According to Allen, that figure refers to the number of days “where his main focus” was Democratic Governors Association business or other “non-state” events. The governor also took another 20 weekdays and 11 weekend days of vacation in the past year, Allen says. Fair enough. But it’s worth noting that, at its core, the DGA is a fundraising organization. And while it does regularly hold what it bills as “policy conferences,” those are actually exclusive fundraising weekends featuring Democratic governors; they are generally open only to the organization’s top-paying corporate and union donors. It’s also worth noting, as Seven Days reported last week, that Shumlin raised a large portion of his recent campaign haul during DGA-sponsored trips. In so doing, he has managed to raise money throughout the country for his own reelection campaign, without spending a dime of his own campaign money on airfare, lodging and other expenses.